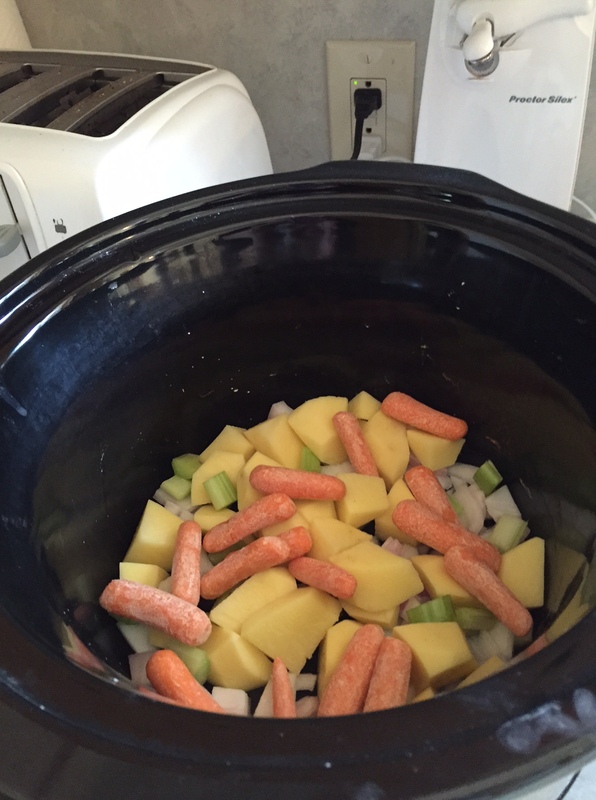 I was able to use my crock pots several times this week. This was the start of a beef stew. I used the leftover roast beef from last week, along with the rest of the baby carrots in a bag. I added onion, celery, potatoes, beef broth, thyme, salt and pepper. I put in a little garlic salt, also. I can’t find my home-canned tomatoes yet, but thankfully, I was able to find a purchased can on the shelf. So, I put that in, along with the leftover cooked potatoes and carrots from when I cooked the roast. It came out amazing. I was pleased because it was so tasty, and used up a lot of things out of the fridge. I made a lot of pinto beans into meals where they will be used (or already got eaten). We got at least 1/2 of the home-canned jars onto shelves. We’ve already been into the pears, fruit cocktail, broth and raspberries. There was a huge thunderstorm, including tons of rain and hail. The drains filled on the streets on the way home from church and it was wild with the lightening, thunder and standing water. I wasn’t surprised to see that the small lettuce, boc choi, etc. in the garden were pulverized. I’m hoping the nice weather we are now having will give the plants a chance of perk up a bit and that I might still get something. 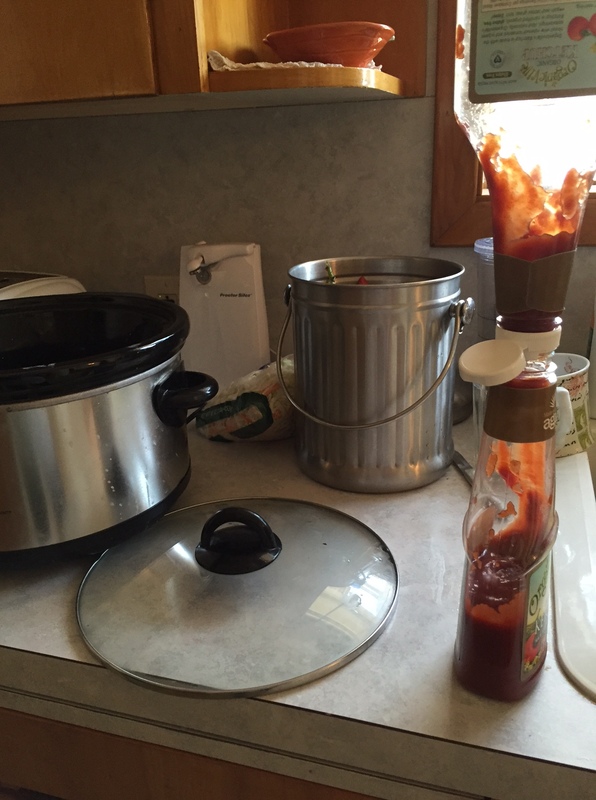 I emptied an almost empty bottle of ketchup into another one to get every drop. I filled the compost bucket several times and poured it onto a compost pile we are starting. 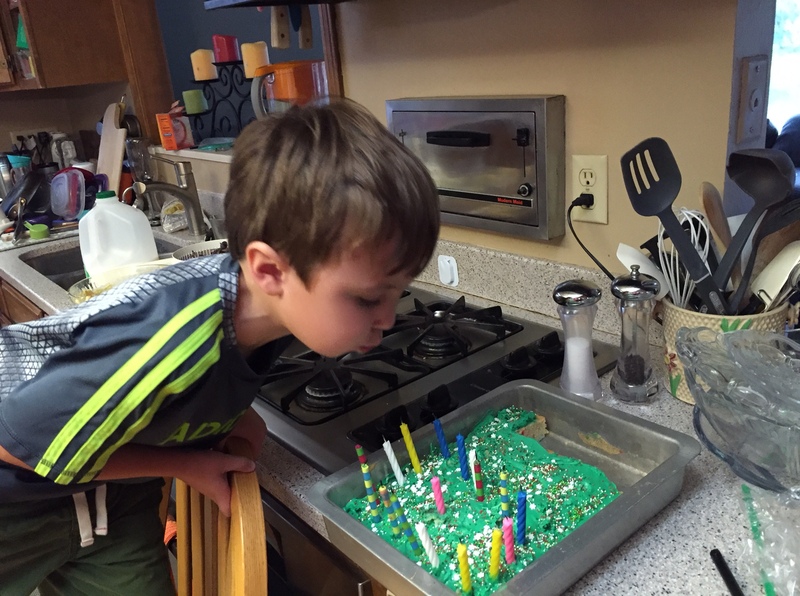 Jake and I got a lot of mileage out of a boxed cake and some old candles. I must point out that it is NO one’s birthday. He was just in the mood. celebrate their hard work in school. Ja’Ana and I went to an appointment on Thursday, after toiling diligently for weeks, and now she has the grades, credits, etc. properly recorded for last year’s homeschool work. Alissa and I have worked for hours on her homework after school in the last 2 weeks and she is trying so hard. I know Michaela is doing what her teachers are asking her to do at school. So, it was fun to celebrate with all 3 of them in the short time before Jake came home. Sometimes I know these kids do not always get the credit for how hard they work for everything. Although school is easier for some than others, it is very hard for all of them. I want to keep encouraging. The stew sounds yummy.. So happy your getting your stuff all in the house, and can start enjoying those canned items. Proud you enjoy your job.. And how fun that you are getting to celebrate with the kids.. It was very cute! He really wanted to set the table all fancy, but I finally convinced him that there were no relatives coming:) He settled for 16 candles because Ja’Ana is 16 and made her come over and stand while HE blew them all out! So funny. That Jake is adorable! 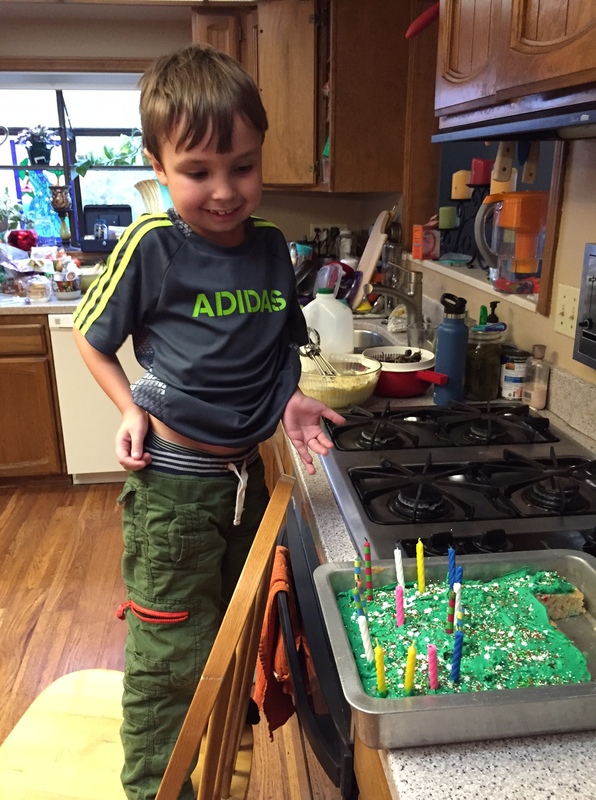 How cute that he wanted to have a birthday cake and that he had Ja’Ana stand by him while he blew the candles out. 🙂 You stew does sound good and I pray at least some of your plants make a comeback after that storm. Such a lovely moment! Great idea to celebrate a non-celebration. Life is too short not to enjoy it! The boy knows what he wants:) And, he wanted it to be a birthday. So, it was. It was fun!